We are constantly told that immigration from eastern Europe contributes to our economy and provides much needed labour for our hospitality and catering industries. But the direct experience of the European Union's free movement of labour on manufacturing jobs in the northeast of England shows a very different story. It is a story of the deliberate destruction of manufacturing jobs in Britain dating back to the time of Thatcher and continued by Blair. There has been a shortage of skills in manufacturing industry since the Thatcher government abolished apprenticeships. Today, there is a massive shortage of all engineering and construction skills, leaving an ageing workforce in sole possession of those skills. Employers have obviously seen this, and some have taken last-minute steps to reinstate apprenticeship schemes and training, but there is a four-year gap before these youngsters become trained and there is no guarantee that they will work for the employers who have trained them. Most employers have been waiting for the accession of eastern European countries to the European Union and the consequent free movement of labour. There is an abundance of highly skilled cheap labour in those countries, particularly Poland. These workers benefited from the training and education provided by their socialist governments before the collapse of the Soviet Union. Existing EU countries could impose time restrictions on the movement of this labour and most did. But the British government, through Jack Straw, invited them to work in this country from day one. 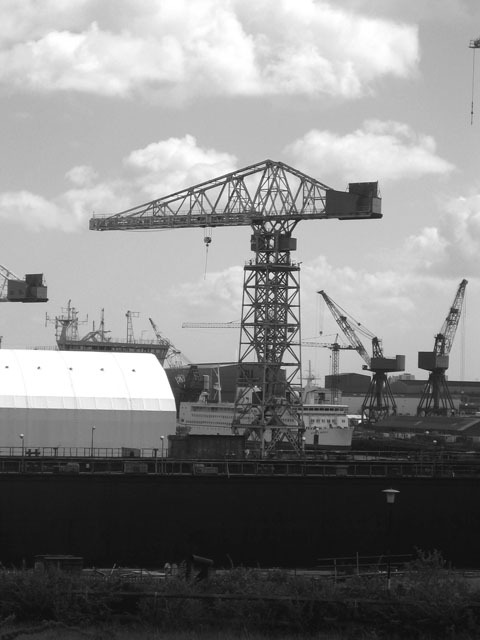 Shipyards: it is now common for companies to recruit cheap Polish labour through agencies in which they have a controlling interest. It is now commonplace for industrial employers to recruit cheap Polish or Lithuanian labour through agencies in those countries in which many of those companies have a controlling interest. On Tyneside, for example, there are increasing numbers of cheap Polish and Lithuanian skilled workers. The unions, through the Confederation of Shipbuilding and Engineering Unions (CSEU), have had to develop a strategic response as it became clear that not only were companies recruiting from Poland and Lithuania, but they were planning to set up training programmes in those countries to ensure a permanent supply of cheap skilled labour. Knowing the companies' intentions to pay the immigrants only the national minimum wage, less than half the skilled rate, the unions' first job was to get agreements with employers to get them on the skilled rate. Unions have been able to do this where they are well organised and the employers are prepared to bide their time until the ageing skilled workforce retires or dies. So agreements have been reached with Hertel International Marine, for example, to pay them £12.10 per hour and for the Poles to live in humane conditions in local bed and breakfast houses. British Engines Ltd and Parsons (now Siemens) have similar agreements. Where the unions are not so well organised it is a different story and these workers are at the mercy of capitalism. A&P, formerly Appledore, have ship repair yards on the Tyne and the South Coast. At their Hebburn on Tyne yard they have subcontracted to an agency that employs about 60 Poles out of a workforce of 170. The Poles are paid the national minimum wage, have deductions from their wage to pay the agency as well as deductions for their accommodation, and are housed in cabins within the yard. They have no safety training and, unlike previous immigrants from Ireland, Jamaica and Pakistan, they do not speak English. A&P has a history of subcontracting and has replaced nine existing subcontractors with foreign skilled labour, denying work to local skilled workers who may have worked casually or are on the dole. It gets worse. A&P holds 51% of the shares in a Polish employment agency. The immigrant workers are brought over for ten weeks, then returned to Poland for a break before returning to Hebburn. But after attempts by the CSEU unions to contact the Poles and pressurise the company, A&P now sends them back to Poland every 10 weeks and brings fresh workers back, making it impossible to organise them. An estimated 300,000 migrant workers have entered the UK since 2004 when the government implemented open access to eastern European states that joined the EU. Based upon Treasury data, the banking and finance consultants Ernst & Young Item Club report indicates that the economic migration has placed an estimated 80% of these workers in jobs paying less than £6 an hour, brought swathes of non-unionised 'flexible' workers onto the market undermining wage rates and pensions, introducing "a very positive cost-benefit" to companies – cheap labour in English. An organisation called MultiHands offers employers over 500,000 registered workers from eastern Europe, covering all skilled, unskilled, manual, non-manual, professional, clerical jobs etc to fill jobs in the UK. Unemployment in the UK has now reached an official figure of 1.7 million, leaving aside the "economically inactive", estimated at 8 million people. Clearly, as the ageing workforce at A&P retire or more likely are made redundant, the entire workforce will be made up of casual Polish labour. Those employers who have reached agreement with the unions are simply delaying this process. British Engines, for example, is providing free English-language training for its Poles in working time – so the company is obviously in it for the long term. The consequence of this strategy will be the total elimination of British skilled industrial workers. Take the Cape Group as an example – its business is scaffolding and insulation. Many trade unionists will remember the difficult litigation against Cape claiming compensation for asbestos-related diseases. Cape has set up a training centre in Poland to train 1,000 thermal insulation engineers to work in Britain – paid for by EU grants. Remember how Blair gave away most of the UK rebate at last year's EU budget negotiation? That money is going to eastern Europe and funding projects such as Cape's, which is paving the way for all other UK employers. As that rebate was our money, we are effectively paying to be destroyed. You can move an entire motor production line to Poland or Slovakia, but some industries cannot be moved east. For example, a new generation of British power stations needs to be in Britain. So, if you can't move the industry east, move the labour here. Polish workers will build Tony Blair's new generation of nuclear power stations! Or maybe the workers will be from Bulgaria or Romania. As the Tyne and Blyth District Secretary of the CSEU told Workers, "We are looking at the total collapse of the infrastructure of an industrial society and at a serious reduction in wages, with the British motor industry at the top of the list. Our younger people, Thatcher's generation, have been denied skills and work. This means about twenty per cent of the population have been abandoned by our government." That Eastern European labour contributes to the economy is a myth. Most of their wages go home. Few will want to abandon their homeland, so their use of the NHS and other public services represents a transfer of value from Britain to their home country. It really is Auf Wiedersehen, Pet on a gigantic scale. It will not stop at manufacturing and construction. When two rival bus companies fought each other in the North East, one of them, Stagecoach, recruited all the available bus drivers, including their rivals' – and just sat in the staff canteen to deprive their rival of drivers. The rival simply recruited from Poland. That's a dispute between capitalists. Imagine what would happen if there was a strike. Employment agencies boast that they can supply staff from all eastern European countries in the fields of finance, hospitality, construction, engineering, care, technology and many others, from unskilled labour to management – selling the legacy of the high level of skills from the former Soviet bloc. How are the CSEU unions going to tackle this? Not easy! First, it is necessary to understand the nature of this process. It is a continuation of the deskilling of the British working class and the destruction of British manufacturing industry. It is about capitalism abandoning Britain. It is deliberate and it is thought out. Remember, Labour decided that Britain would let them work here from day one while most other EU countries chose to deny them entry for some years. How can this be anything other than deliberate targeting of British manufacturing jobs? There's no point asking the government to do something – they are the problem. This process is being driven from Downing Street. The unions recognise that in some cases, if they don't agree to foreign labour in the short term, the employer will move abroad. So they will be stressing equality of treatment, saying that in addition to paying the rate for the job and providing decent accommodation, the employer must agree to quotas of British apprentices. So, for example, for every ten Poles or Lithuanians, they must take on one or two local apprentices, including adults such as redundant miners or steel workers as late-start apprentices. The employer knows they will be unproductive for two years, so this is where the battle is. Who will pay for this? The unions have to try to organise the foreign workers. This is very difficult as they don't speak English and tend not to live with or near other workers. There is currently resistance among some British workers to have them in the union as they are seen as transient. In the North West, Amicus had to bite the bullet and bring over from Poland a representative of the Solidarity trade union to speak to Polish workers and urge them to join the union. Maybe they will have to do that in the North East. The unions are trying to work through the old Polish societies and clubs that exist around Polish communities that have lived here since WW2. Perhaps they will at least find someone to translate for them. But some of the Polish workers at A&P in Hebburn are beginning to complain about their conditions. They are beginning to realise that they are part of the new slave trade. Perhaps this is where the breakthrough will come, but we can hardly sit back and just wait for it.